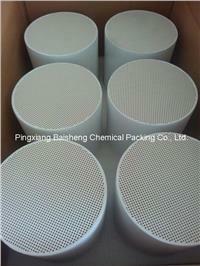 Honeycomb ceramic for Diesel particulate filter(DPF) cordierite as material. main compositions are SiO2,AL2O3 and MgO. Diesel particulate filter is simply called DPF. The main composition of tail gas discharge from diesel is carbon particulates. Diesel particulate filter is a setting to reduce emission granule by filtrating which is set in exhaust system in diesel. Its efficiency for carbon particulates filtration is more than 90%. Part of dissoluble organic composition (SOF) (especially high boiling point) may be trapped. The filtration material researched and used in China at present is of three types: ceramic, metallic and composite based. The common types are ceramic based (cordierite or silicon carbide) and metallic based (stainless steel wire mesh) diesel particulate filter. Working principle of particulate filter: Plugging up two ends of porous beehive ceramic in turns to filtrate PM by ceramic wall. Regeneration of filter: Burn the particulates by rising the gas temperature in filter to filtrate PM which piled in the filter so as to guarantee the function of filter. The character of particulates in exhaust gas of diesel relates to concentration of oxygen. 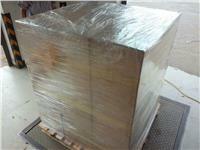 It will burn in temperature of 550-650°C. Cordierite Diesel particulate filter adopt cordierite as its material. Its main compositions are SiO2,AL2O3 and MgO.